The Muskegon, Mich., steel casting facility’s multifaceted approach to corporate responsibility includes improved employee health care, waste limitations and community engagement. In a basic sense, frustration grows from the difference between the way things are and the way they ought to be. The traffic jam on your daily commute—why should a tiny fender-bender cost everyone 20 minutes of their day? The stunted growth of your business in a specific market—can’t potential customers see that the price and product are more than competitive? The distance between what is and what should be isn’t traversable. Rather than sitting around waiting for a moment of genius, the best problem solvers, more often than not, earn results by chasing an initial idea with plenty of hard work and determination. Eagle Alloy Inc., Muskegon, Mich., has a long history of unique solutions to common problems. The steel casting facility played a crucial role in developing Western Michigan’s Resource Recovery Corp. in the early 1990s. It found a way to reduce natural gas consumption by using methane from a nearby landfill for heat treating furnaces a decade later. This year, Eagle Alloy, as one of four companies in the Eagle Group, partnered with two local businesses to open onsite medical clinics that would improve employee health and control health care costs. John Workman and Mark Fazakerley, co-owners of Eagle Group and natives to Muskegon, couple this dedication to internal problem solving with a commitment to the surrounding community through cooperation with local and state government, educational events and charitable causes. 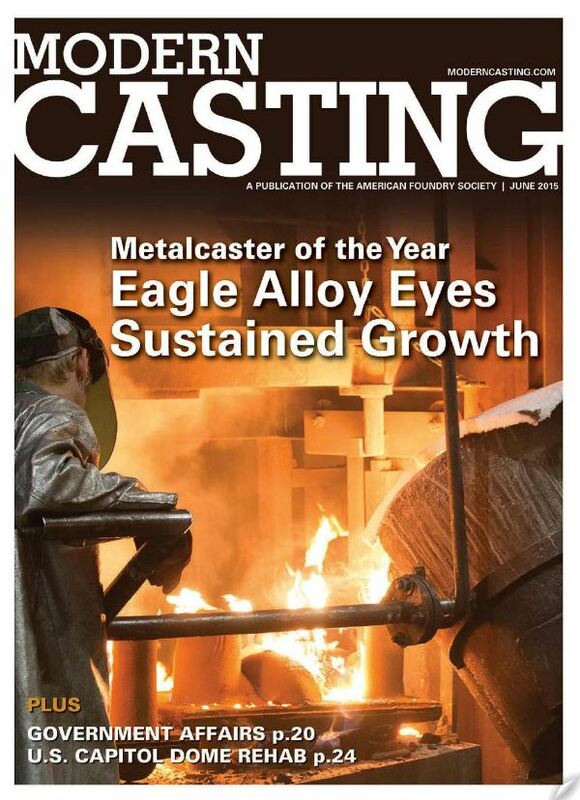 This continued dedication to corporate responsibility, often leading to innovative solutions, is why Modern Casting has selected Eagle Alloy Inc. as its 2015 Metalcaster of the Year. For the past decade, Eagle Alloy has developed an employee wellness program that includes health risk assessments, consultations with health coaches and regular biometric testing. The voluntary program also includes financial incentives for participation and improvement. Even still, the company only saw about 50% participation among its 450-person workforce. Eagle Alloy recently began exploring the idea of opening an onsite medical clinic to improve employee access while reducing overall health insurance costs. Through its insurance agent—Eagle Alloy is self-insured but requires one for its third-party administration and reinsurance—the company was put in contact with a Muskegon-based clinic management services provider. That provider would cover clinical supplies, paperwork and staffing, including two physician’s assistants, a nurse practitioner and medical director. With an upfront investment of $80,000, Eagle Alloy built a modular clinic onsite, allowing free visits for employees and covered family members. Eagle Alloy’s facility officially opened Jan. 19 as the second Muskegon Manufacturers Health and Wellness Clinic after Port City and Fleet Engineering’s opened a month earlier. Rather than replacing an employee’s primary doctor, the clinic aims to increase preventative care while reducing cases that require acute or emergency assistance. Eagle Alloy’s site operates 16 hours a week, with partners Fleet Engineering and Port City Group operating a second clinic for another 20 hours. In addition to colds and ongoing health concerns, the clinic also handles workplace injuries, which increases response times while decreasing employee’s missed time. Employee participation continues to grow from month to month, increasing to 57 visits to the clinic in April from 49 the prior month. Eagle Alloy’s wellness program continues to be a part of its approach to health care. After increasing health insurance costs for those who forego participation, employee participation has increased by 42%, meaning more than 80% of the workforce is enrolled. Eagle Alloy has seen results from the time and resources invested in these initiatives, with health care costs nearing what was spent in 2009. Meanwhile, according to a 2014 study from the Kaiser Family Foundation (KFF), a non-partisan health care analyst, premiums have risen by 26% in the past five years across the nation. KFF also reported that during the most recent plan year, costs per employee per month for Eagle Alloy and its group were 30% less than the average manufacturing employer in the U.S. Taking a proactive approach to employee health care concerns and costs may turn into a significant improvement for Eagle Alloy, but the company has a history of undertaking initiatives to solve problems in a way that leads to long-term improvement. In the early 1990s, Workman began exploring ways to decrease costs associated with managing foundry residuals, including spent sand from the 270,000-sq.-ft. facility’s shell mold and coremaking operations. Workman arranged a meeting at a local watering hole with other metalcasters to discuss the problem. That money, along with $30,000 from each of the 15 members, provided the group with nearly a half-million dollars in seed money, which jump-started the formation of Resource Recovery Corp. (RRC), Coopersville, Mich. In the past 20-plus years, RRC has reduced costs associated with metalcasting byproducts by two-thirds through beneficial reuse efforts. The outfit also has diverted more than a million tons of byproduct from disposal at local landfills. More recently, Eagle Alloy began an expansion effort in 2011 that included improvements in heat treatment, mold and coremaking, and melting departments. Quickly bouncing back from the economic hardships of the previous years, Eagle Alloy saw an opportunity to improve its operations and boost capacity. Representing half of the total $14 million investment, a new thermal reclamation system could significantly decrease overall consumption and disposal costs. In collaboration with its sand and binder supplier, Eagle Alloy was able to recycle as much as 80% of its spent sand. Additionally, during the two-year project, Eagle Alloy had segregated its spent sand in the landfill so it could be mined and reused once the reclamation system was operational. A third example of Eagle Alloy’s innovative outlook involves a solution that didn’t have a clear problem. Fazakerley drove past a local landfill and noticed the flame from burning methane. As natural gas prices continued to rise in 2007, he wondered if the landfill’s excess methane could find a beneficial use in his metalcasting operations. In a partnership with the landfill, along with help from the county, Eagle Alloy split the cost of a seven-mile pipe and the associated equipment necessary to feed its heat treatment furnaces with methane gas. Natural gas prices have plummeted in recent years, down to $3 per million btu from more than $8 in 2008. Still, Eagle Alloy continues to benefit from the project by paying approximately half the New York Mercantile Exchange rate for natural gas, while the landfill receives payment for what otherwise would be waste. Since its founding in 1979, Eagle Alloy approaches corporate responsibility in a comprehensive manner. In addition to improving employee health care and reducing consumption and cost associated with daily operations, the company has a long history of involvement with the community. Both Workman and Fazakerley were born, raised and continue to live in the Muskegon area. Besides volunteering for the YMCA, Red Cross, United Way and more than a few other community organizations, the co-owners value education outreach in an effort to improve neighbor relations, while also showing people exactly what a metalcasting facility is and what it does. To this end, Eagle Alloy, along with other members of the Western Michigan AFS chapter, organizes an annual student day. At the 2015 event, more than 100 children from 12 school districts were able to tour Eagle Alloy’s facilities and learn about its operations in the morning before touring a second location in the afternoon. 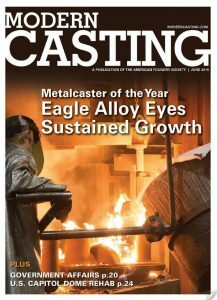 Eagle Alloy representatives also routinely demonstrate metalcasting techniques in grade schools and engage high-schoolers at career day events. Currently developing an internship program with the local high school, the company continues to communicate with its neighbors.